We arrived in Beijing at 6am and the temperature contrast was immediately apparent. We seemed to be the only ones stepping out into the dawn in shorts and no coat as the rest of the flight were prepared and wrapped up in scarves and gloves. After a lengthy transfer to the airport, shuttle trains round the vast complex and security, our bags were waiting for us and we made our way to a taxi counter. Both tired we opted for a taxi rather than the airport train and this was a mistake. We also seemed to have chosen the private luxury desk so our taxi was double the price it should have been. Not to mention the language barrier trying to explain where our hotel was. The taxi took about an hour or so and we arrived at the hotel about 8:30ish. The room was unsurprisingly not ready so we sat down in the lobby and enjoyed some wifi. Fed up with sitting around, we unpacked our coats and jumpers and prepared to head out. We were then told our room was ready so instead we headed straight for some sleep. Coming from Yangon, the time difference and short flight we had only had about 2 hours sleep. A long nap later we ventured out into the cold Beijing air. It turned out our hotel was in a great location- just around the corner from the Forbidden City. We walked around the grey communist buildings and busy streets and came face to face with the Palace. Impressive and imposing, but also closed on Mondays. Instead we walked around the outskirts to Teiniman Square, the iconic location where every western news reporter stands if anything news worthy happens in China. The annual People’s Party Conference was taking place so most of the square was closed, and long security screening queues were everywhere. 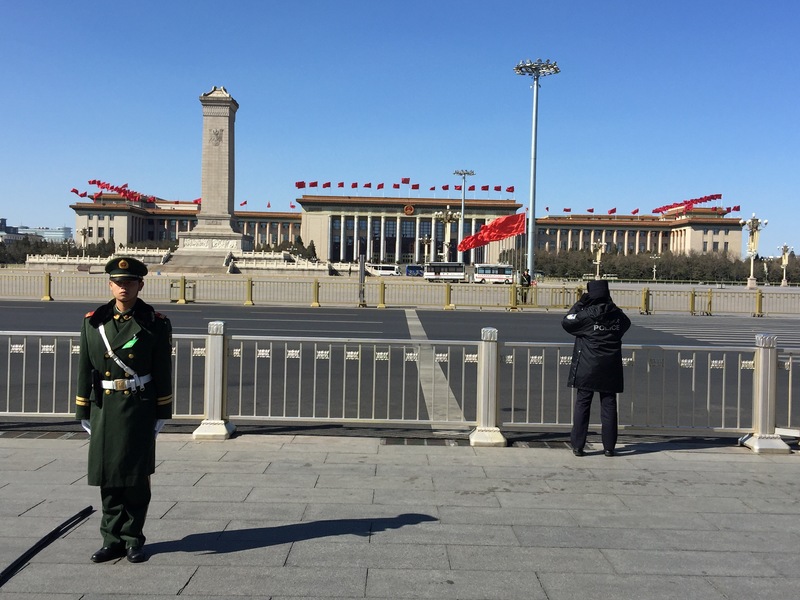 After having our passports checked we entered and took photos of the square, gate into the Forbidden City and the large portrait of Chairman Mao. After a lot of walking we headed back to the hotel via a Chinese Tesco supermarket. We would nature out tomorrow for when things were open. Before we headed into town we booked a tour for the following day from a local shop and an enthusiastic Chinese lady. 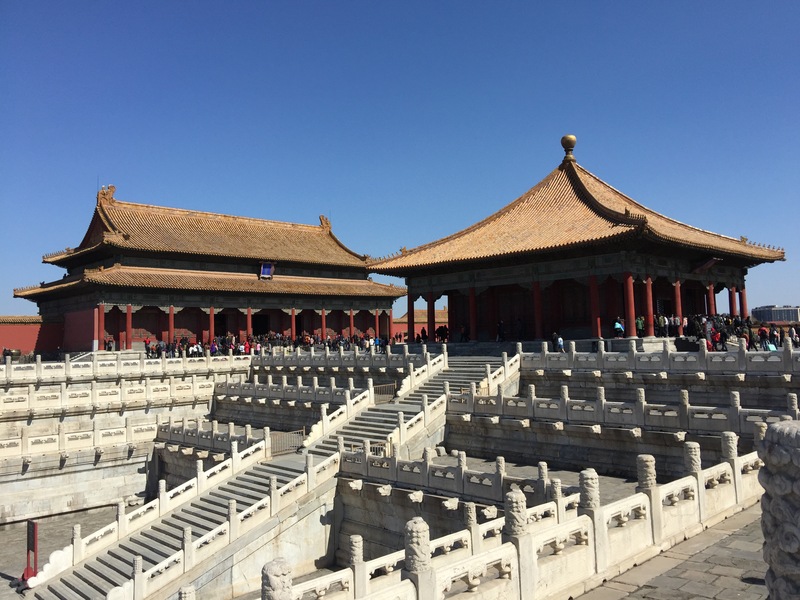 Ming Tombs, the Olympic Park and The Great Wall would all be included. Our first stop the next day was again Teiniman Square and even longer security queues. We hoped to be allowed in the square itself and see Chairman Maos tomb, but alas this was closed all week. What was open however where the gates into the Forbidden City. Overall 16 emperors had lived in the city each adding their own stamp on the site. Each building to us though looked like a bigger version of the last. That having been said they were all beautiful, with yellow roofs and vast courtyards. 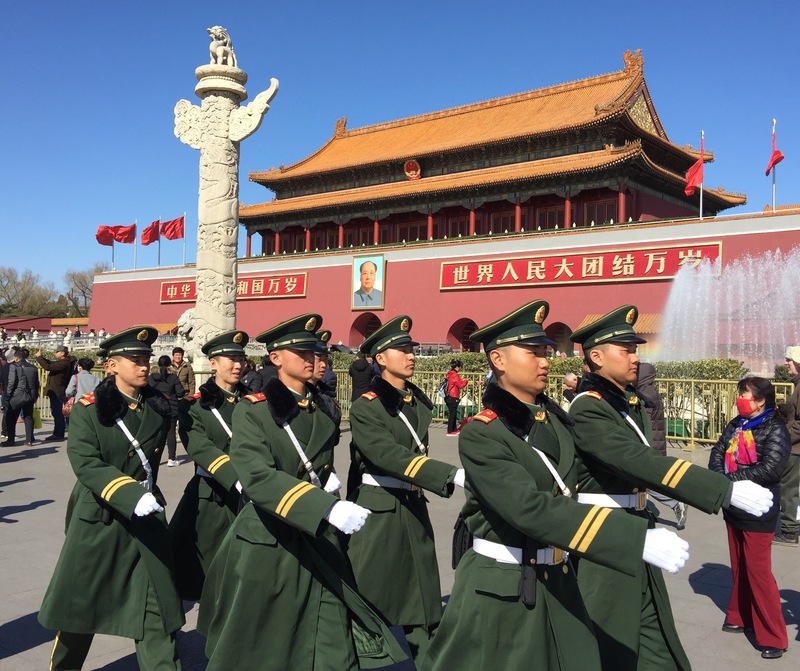 A must see in Beijing. At the end there was a man made hill in another park that looked like it would provide gorgeous views of the city. Another site for another day. We found a local place for lunch and ordered. Some tasty noodles and even tastier pork dumpling rolls turned up. The elderly owner took pity on us and gave us a fork after watching us struggle with chop sticks. That evening we headed into town and met a friend for dinner. He took us to a hot pot cook your own restaurant. Quite the experience as we boiled our meat, made our own sauce and watched a man do noodle acrobatics in front of us. The dinner was even complete with a Chinese Opera. Not singing but a man in costume who quickly changes his face masks while dancing! Fed and tired we headed back ready to climb the Great Wall the following day.